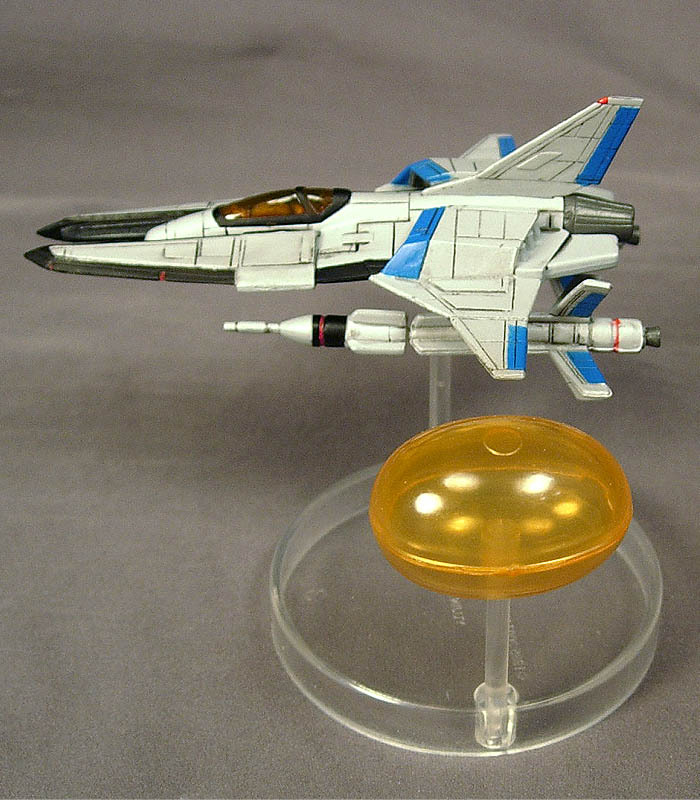 Gradius Vic Viper T301 with Option is a small plastic kit packaged in a capsule that was sold in Japan in November/December 2007. Packaged unassembled, the set's dozen pieces quickly piece together on a clear plastic display stand. Highly recommended to all fans of the series or nifty space toys. About $4 before shipping at NCSX. This item is presented for review and entertainment purposes only. It is not for sale. Please search eBay, Google, Anime Jungle, or your favorite source of Japanese collectibles to determine if you can purchase this item. Yujin has really come out as a fantastic friend to Japanese pop culture. From Zoids to random anime girls, they're cranking out all sorts of amazing (and mostly cheap) licensed goods from the biggest video games of all time and the most obscure TV series you'd hope to see. And they decided it'd be a good idea to do a line of small shooter toys, and we couldn't be happier. 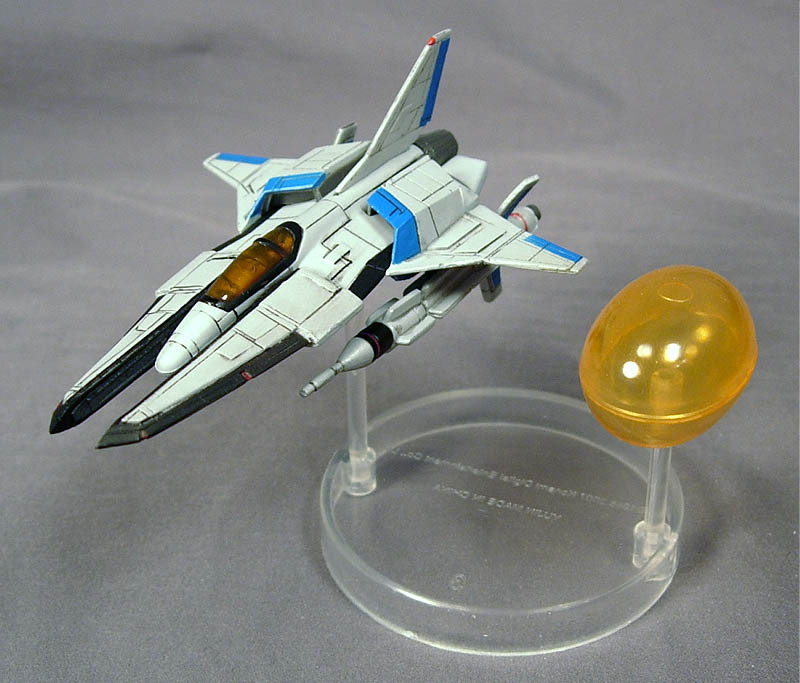 Gradius products are far and few between, and it seems most of them stay in Japan. 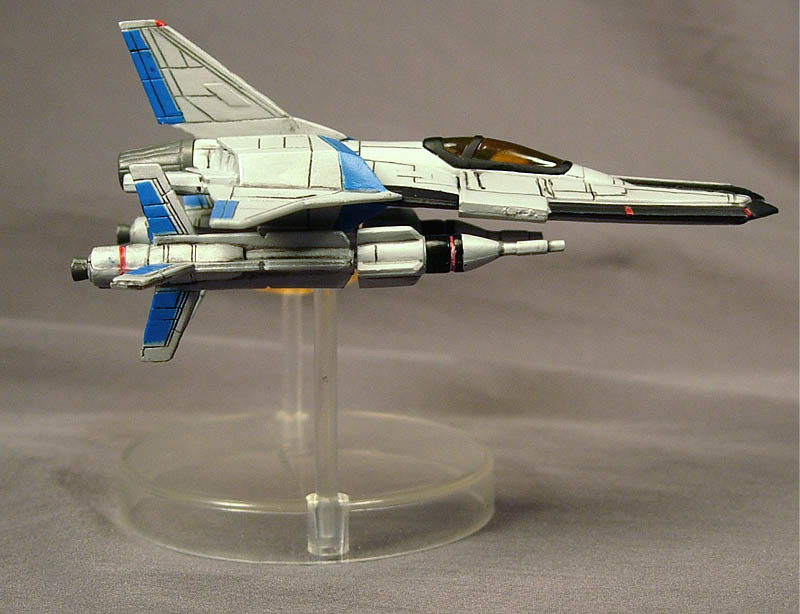 A pewter Vic Viper was produced a few years ago, around the time of Gradius V, and we missed it-- we decided we wouldn't miss the next item, so we snagged this modestly priced capsule toy. It's a couple of inches long, about the same size as Hasbro's line of Titanium Series vehicles which sell in the USA for $5-$6. This kit sold in Japan for 300 yen, or roughly $3. Thankfully, the toy was pre-painted, and the end result wasn't half bad. The black panel lines were painted in, but as you can see there are places where it wasn't exactly perfect-- they missed a few spots. The blue highlights, clear orange canopy, and everything was taken care of before you even cracked open the capsule, which is fantastic for lazy swine like us. 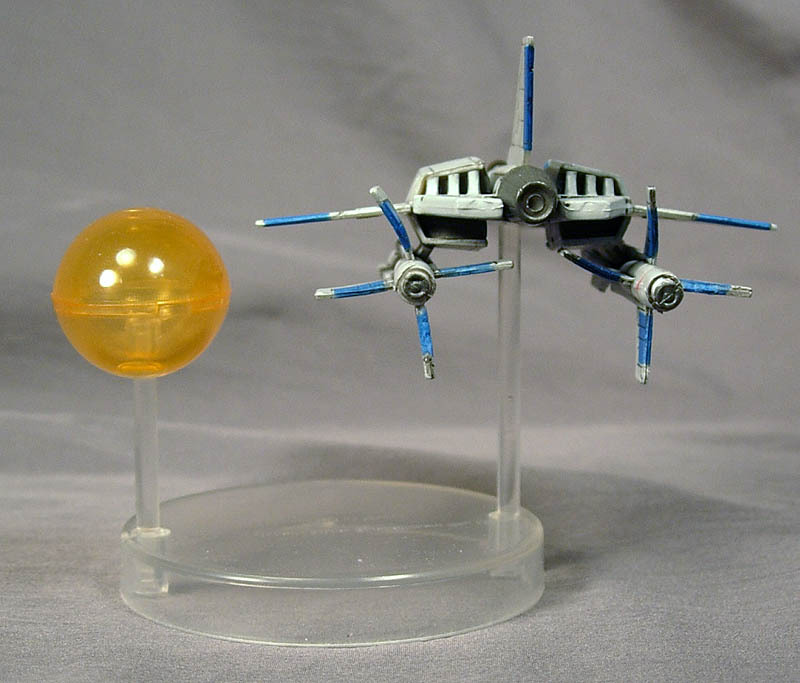 The clear orange "option" has no deco and required no assembly-- it's an orange orb which just sits atop a clear peg. It doesn't do anything and I guess it's a fair approximation of the object from the game, which I've always pictured as sort of a very small sun-like ball of energy. 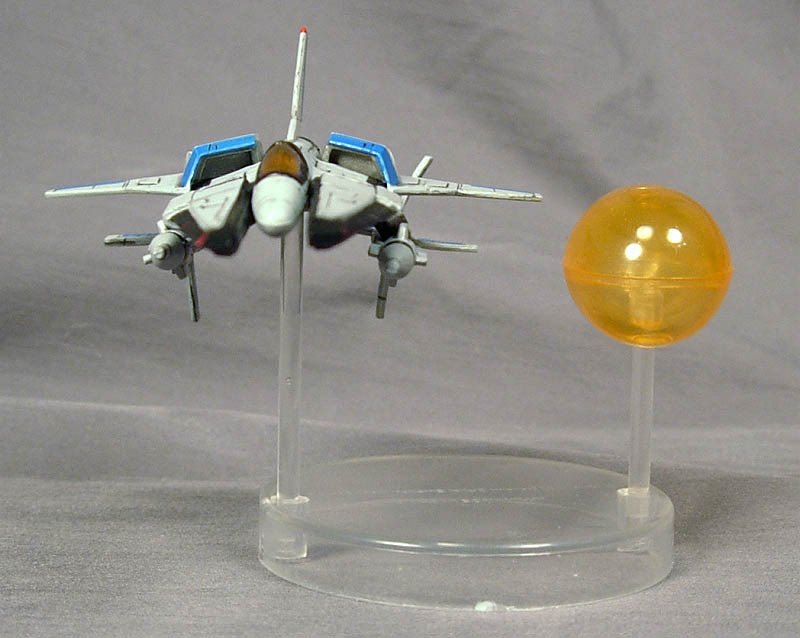 Both the Vic Viper and Option sit atop a clear stand which, not surprisingly, also requires limited assembly. The clear plastic disc has two holes in it, which each fit a single clear plastic peg. All together, you get a fairly elegant display base. We say "fairly" because clear plastic, with time, shows a lot of dust-- which can be a little unpleasant to clean over time, but seeing how toys like this are purchased, enjoyed briefly, and then thrown in a drawer or disposed of, we don't think Yujin was considering its long-term prospects. 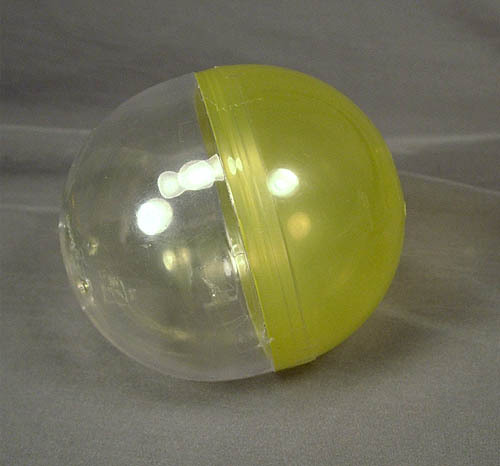 This toy came packaged in a stupid capsule thing-- basically, the parts were in bags, and the bags were in this little egg thing. Not only is it simple, but it's pretty dull. It also comes with a paper flyer advertising the entire collection of Shooting Game Historica Ver. 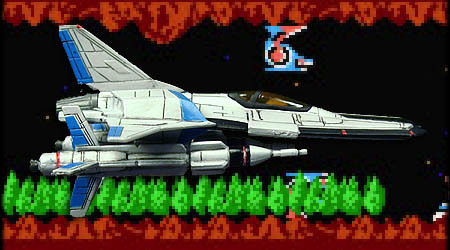 1.0, which also includes the R-9A Arrow head from R-Type, red and blue Silver Hawk vehicles from Darius, the OF-1 Daedalus from Image Fight, and the Metarion from Gradius 2, the MSX game, not Gradius II the arcade game. We find this to be a gorgeous little collectible and we're quite happy to have it. 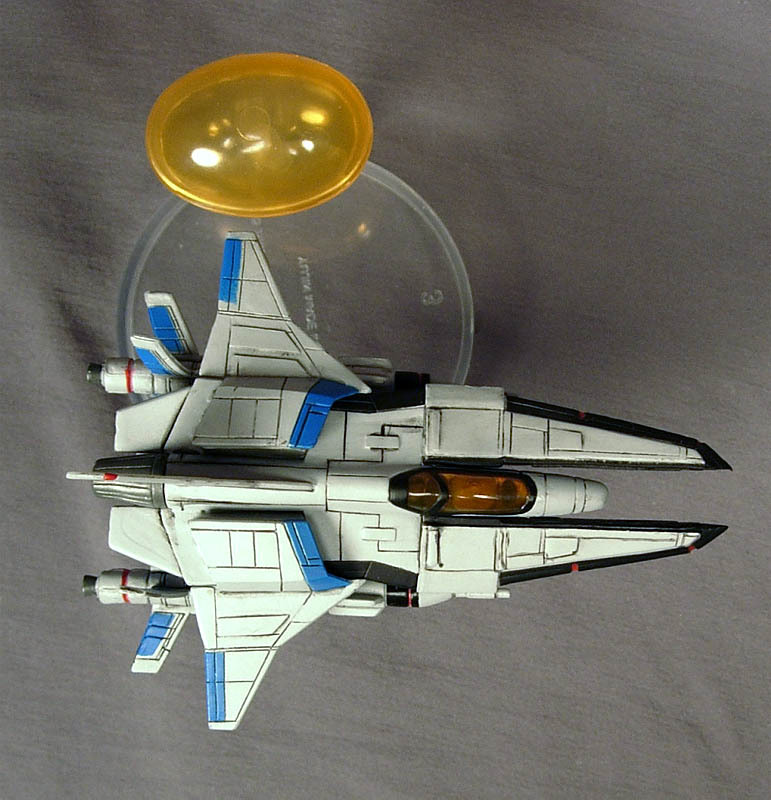 The size fits well with other collectible space ships from Hasbro and Johnny Lightning, and at press time, the Vic Viper is quite cheap. We expect it to be pricey down the road, but that's for you poor saps in the future to worry about. If you can get it for $5 or so, you'd be a fool to pass it up. Because we are suckers we'd easily have dropped $20-$25 on such an item, but thankfully we did not have to. Reviewed on Janaury 2, 2007.